This handout picture from Samsung Corp shows a computer image of the 'Burj Dubai' in the United Arab Emirates, which will be the world's highest building when completed in November 2008. DUBAI (WAM) — A syndicate of three UAE banks, Mashreqbank, Emirates Bank International, and Abu Dhabi Commercial Bank, signed an agreement to provide the required contracting finance for the consortium chosen to construct Emaar's iconic Burj Dubai Tower, valued at Dh3.2 billion ($869m) and soon to become the world's tallest building. The agreement was signed with the Korean contractor Samsung Corporation and its project partners: Belhasa Six Construct LLC and the local company Arabtec Construction LLC. The syndicated facility will be shared equally by the three banks, with Mashreqbank acting as the Facility Agent and Security Agent. "It is an honour to be associated with the construction of such an historic building," said Abdul Aziz Al Ghurair, CEO of Mashreqbank. "The prestigious Burj Dubai Tower is set to become the world's tallest structure and an icon of Dubai's vibrancy for the entire world to see." Due for completion by end of 2008, the Burj Dubai Tower will be the centrepiece of the 500-acre, US$8 billion 'Downtown Dubai' development. The final height of the tower is still shrouded in mist with rumours ranging from 700 to 900 metres. The current holder of the world's tallest structure record (excluding antennas) is the 101-storey Taipei 101 tower, standing at 508m, just ahead of Malaysia's Petronas Twin Towers, at 452m. Anis Al Jallaf, MD & CEO, Emirates Bank said "The Burj Dubai transaction is a demonstration of Emirates Bank's commitment in supporting the ongoing development of landmark projects in UAE." 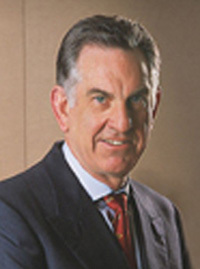 Eirvin Knox, CEO of ADCB said" ADCB is an active participant in UAE's infrastructure development and other large real-estate project finance and is pleased to be part of the contracting finance syndication facilities for the landmark Burj Dubai project." The foundation works for the landmark project have been completed and construction of the Tower itself commenced on 1st February. Chicago-based Skidmore, Owings & Merrill designed the Tower and Turner Construction International is the project and construction manager. Samsung, ranked by Fortune as the 14th largest company in the world, has been involved in the construction of numerous high-rise structures around the world, including the Petronas Towers. 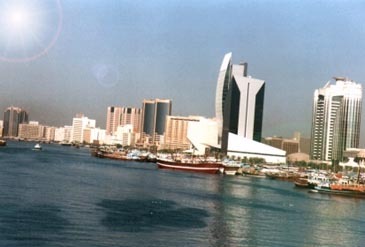 Similarly Besix, which has been highly active in the UAE since 1964 lists among its prestigious high-rise projects the Baynunah Tower in Abu Dhabi and the Emirates Towers Hotel in Dubai. Arabtec, founded in 1975, includes among its projects the 21st Century Tower, the world's tallest residential building , the Jumeirah Beach Residence, Al Fattan Marine Towers and many more. The Burj Dubai Tower, which will combine both residential and commercial space as well as a boutique hotel, is designed to rise upward in a series of spiralling steps as it reaches to the skies in an ever narrowing pinnacle. The Downtown Dubai area is set to become one of the world's most desirable urban developments. 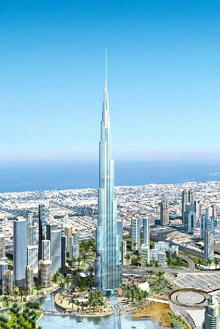 In addition to the Tower it will include Dubai Mall, the world's largest retail edifice, The Boulevard, a 3.5km long parade of internationally-styled buildings, The Residences, exclusive up-market apartments, and the stylish antiquity of The Old Town, all set in an idyllic landscape of gardens and lakes.